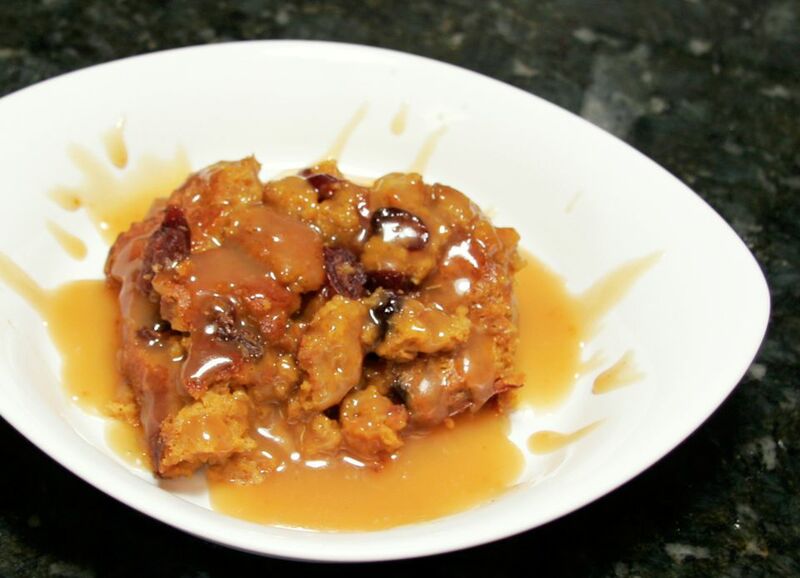 This pumpkin bread pudding is the perfect choice for a fall or winter dessert, and it would make an excellent choice for a Thanksgiving menu. The pumpkin puree and spices make it especially moist and flavorful. Raisins or chopped pecans can be used in place of the dried cranberries, or try another chopped dried fruit. Gather the ingredients and heat oven to 350 F/180 C/Gas 4. Butter an 11x7-inch baking dish. In another bowl, combine eggs, sugars, pumpkin, cranberries, melted butter, spices, and vanilla; blend well. Pour the pumpkin mixture over the soaked bread and stir to blend. Pour mixture into the prepared baking dish. Sprinkle top with cinnamon-sugar, if desired. Bake for 45 to 60 minutes, or until the pudding is firm and set. Serve with a ​vanilla dessert sauce or brown sugar sauce, whipped cream, or vanilla ice cream.